Did you know that you can use Google to search Access World Forums and get a more refined result? I find that the search facility provided by vBulletin forum software is excellent at searching for single words. However it does not provide the sophistication of tools like Google for searching for exact phrases. What to do when you are stuck! Occasionally you can get stuck in your MS Access Project and don’t know how to proceed.. We all get stuck from time to time and it’s a big problem; but when you’re starting out it’s an even bigger problem, because it’s so difficult to find what you want… Just searching the Internet willy-nilly can return you frustrating and confusing results. Therefore I suggest you use the advanced features of Google Search (See the video on this page or click on the green button!) 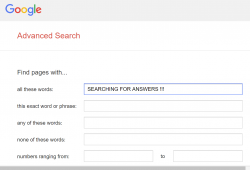 and target that search at a specific knowledge Site, one that has a far higher chance of answering the question you are searching for an answer to.. It’s actually quite easy when you know how. However, it’s not always as simple as searching, especially when you are new to MS Access. You don’t always know what to search for, you have an idea, but your search is not returning any sensible results. This is not unusual, this happens because of the way you are asking the question. It’s unavoidable, because if you don’t know the correct term to search for then you’re going to get incorrect search results… What can you do? Join the forum!!! Sign up!!! A very simple process. Then ask, just say:- I’ve got this problem, I’ve searched for this, that and the other, but I’m not getting anything back which is useful can anybody advise me…..